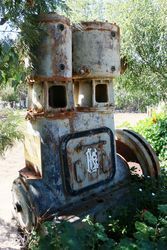 A vertical compressor commemorates the 60th anniversary of Cracow goldfields. 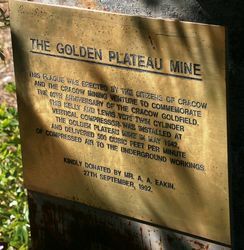 This plaque was erected by the citizens of Cracow and the Cracow Mining Venture to commemorate the 60th anniversary of the Cracow Goldfields. This Kelly and Lewis VC75 twin cylinder vertical compressor was installed at the Golden Plateau Mine in May 1942, and delivered 500 cubic feet per minute compressed air to the undergound workings. Kindly donated by Mr. A. A. Eakin.